It’s week two of the One Room Challenge and our main family bath renovation is well under way. After all of the demo excitement of week one, it feels good to see some real progress happening in our bathroom transformation. I am so glad we decided to tear out that linen closet and replace it with a built-in-nook that will house shelves - on which we will have a mix of hidden storage in baskets and open display areas for pretty things. Andrew measured equal distances from ceiling down and from flooring up to determine the dimensions of the built-in sections that will frame the four floating shelves equal distance apart. Just looking at it now has me so excited about how it will look when it’s all mudded and painted and full of beautiful (+ functional) things. This week I also had the fun task of finalizing some exciting partnerships with some of my favourite brands and things have already started to arrive by mail. So far I am happy to announce that we are partnering with Wayfair, Delta Faucets Canada, Hudson Valley Lighting, Semihandmade, Sol Organics and Terra 20! This is going to be one amazing room when it’s all said and done. Maybe you noticed that wall sconce up there in the first image of this blog post!? It’s our micro sconce and we will be getting two of them from Hudson Valley lighting. In case you haven’t seen the plans for 692 Coffee and Bar that I am designing, I am using brass micro sconces throughout the space and I just can’t get them out of my head / had to have some for myself. While these are not the same sconce as the ones I am using in the coffee shop, I am equally as excited for this minimal approach to lighting. Andrew got the electrical all prepped for the sconce installation. We are installing them on either side of an extra large round mirror (37” in diameter). We also got a good portion of the cement board up for the shower/tub surround - including an enlarged and relocated built-in nook. I never had a built in shelf in the shower previous to moving into this home and I will say it’s a feature I quite like. It keeps products easy to reach and off of the tub sides (which appeal to my at-times neat-freak tendencies). For this new nook we plan on placing a piece of marble on the base to act as the shelf and we will continue the same time up and inside the back of the nook as the rest of the bathroom. Up next is finishing off the plumbing for the two wall mounted Delta Trinsic faucets we have coming from Wayfair. 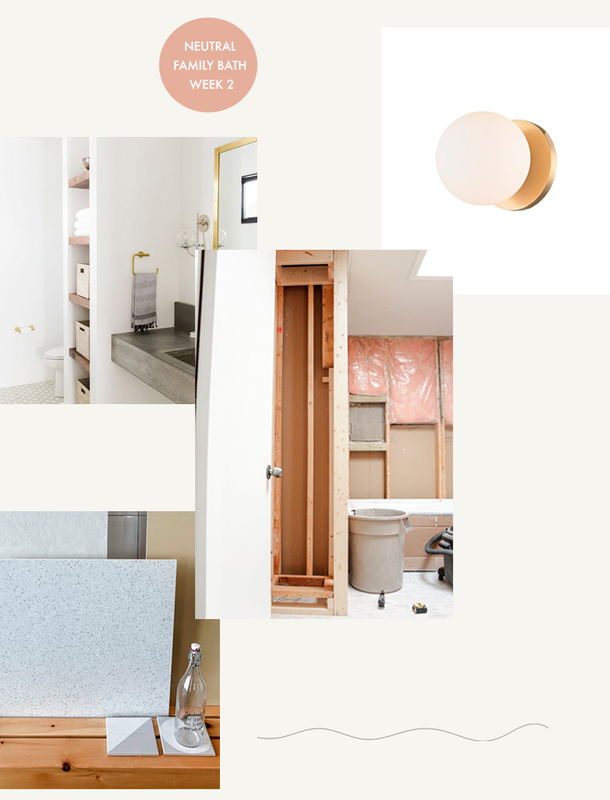 Fingers crossed that we see more drywall up, mudding happening and terrazzo tile back in stock asap (because I have no back up tile plan whatsoever). If you want to follow the renovation closely, I will be posting the progress and plans here on the blog, on my personal blog Calmly Chaotic, as well as on my instagram (Check my IG Stories for video footage). We are now all done the demo phase and I can’t wait to watch it come together! * This post may contain affiliate links and I will be compensated if you make a purchase after clicking through to a link.